Stocks are flat this morning as the East Coast braces for Hurricane Florence. Bonds and MBS are flat. Mortgage Applications fell 1.8% during the Labor Day week as purchases increased 1% and refis fell 6%. The refi index is now at an 18 year low. We saw a 5 basis point increase in rates, which drove the drop in refis. As rates rise, cash-outs, fixed-for-ARM, and FHA for conventional are about the only game in town. Despite tariffs and increases in raw materials prices inflation at the wholesale level remains under control. The producer price index fell 0.1% last month but rose 2.8% on an annualized basis. Ex-food and energy, the number was down 0.1% MOM and up 2.3% YOY. So, despite the increase in wages we saw in the jobs report, inflation overall remains subdued. 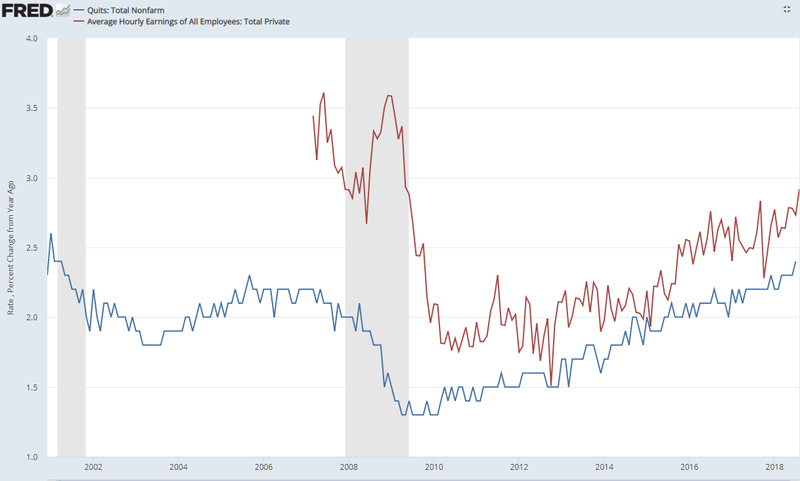 Yesterday’s JOLTs report showed the quits rate (which is considered a leading indicator for wage inflation) hit the highest level since early 2001. Construction job openings increased to set another post-bubble high. Hurricane Florence will only exacerbate the labor shortage as workers get drawn into repair jobs. This probably means disappointing housing starts numbers for the rest of the year. Below is a chart which shows that average hourly earnings and the quits rate tend to correlate pretty closely. Here are some things that homeowners in the path of Florence can do in order to prepare for impact. Note that the hurricane is expected to stall out once hit hits land, so you should expect some flooding inland. Servicers should prepare for an uptick in delinquencies. Redfin has a good retrospective on the top lasting impacts from the financial crisis. Probably the biggest surprise was that a leftist president presided over a huge jump in inequality. Given that Fed policy in the aftermath of the crisis was aimed at supporting asset prices, this shouldn’t be a surprise. The other big surprise was the complete drop off in housing construction despite a tight housing market. 10 years down the road, it is still a head-scratcher. Everyone has a theory about the driver, from gun-shy builders, to labor shortages, to zoning restrictions. The places where the demand is greatest (CA and Seattle) have tight restrictions on building, and such an expensive market that businesses are relocating somewhere cheaper. On the other side of the coin, the Rust Belt is growing again, and that area has a surfeit of housing already built.